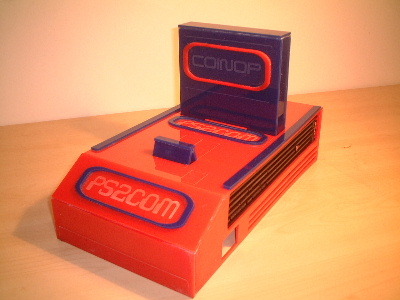 PS2Com – 2003 | JONAH BRUCKER-COHEN, PH.D. PS2Com – 2003 – JONAH BRUCKER-COHEN, PH.D.
PS2Com is a case mod I built for a Playstation 2 gaming console. The case fits over the exisiting PS2 body and the device operates like a normal PS2. but otherwise, you simply slip the cover over your existing PS2 and play normally. This project won 1st prize in the PS2 modding competition held during the Dublin Electronic Arts Festival in Ireland in 2003.